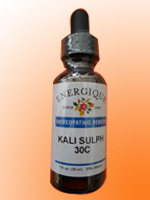 Also known as Kali Sulph. This cell salt may be useful when used in conjunction with Ferrum Phosphate as it is also a carrier of oxygen. It may provide a beneficial effect for many respiratory and circulatory functions. It could be of some assistance where discharges have a yellowish or greenish appearance, especially from the mucous membranes of the nose and mouth. Minor skin eruptions such as dandruff, dermatitis and chicken pox might also benefit from this cell salt.